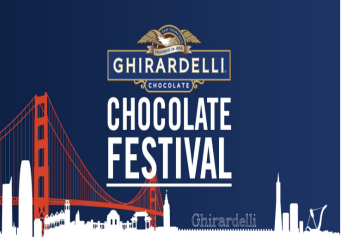 Ghiradelli Chocolate Festival San Francisco Getaway Sweepstakes – Win a trip to San Francisco! ENTER SWEEPSTAKES HERE – Ghiradelli Chocolate Facebook page. ENTRY LIMIT – Only one entry per person per email address. ELIGIBILITY – This sweepstakes is only open to legal residents of the continental United States and the District of Columbia, 21 years or older at the time of entry and shall be governed solely by U.S. law. SWEEPSTAKES ENTRY PERIOD – This sweepstakes begins at 12:01 a.m. Pacific Standard Time (“PST”) on June 1, 2018 and ends at 11:59 p.m. PST on June 30, 2018. PRIZES – There will be one (1) Grand Prize Winner who will win the following: round-trip coach (economy) class air transportation from a major commercial airport in the continental U.S. closest to the winner’s residence (selected by Sponsor in its sole discretion) for themselves and one (1) guest; two (2) nights standard hotel accommodations in San Francisco (selected by Sponsor in its sole discretion); two (2) Ghirardelli Chocolate Lounge tickets for the 23rd Annual Ghirardelli Chocolate Festival (2018), on Saturday, September 8, 2018; two (2) Red & White Fleet Cruise tickets; and a Ghirardelli Chocolate Gift Basket. Approximate Retail Value (“ARV”) of the Grand Prize: $2300.00. Actual retail value of the Grand Prize depends on the date, time, and point of departure of the winner’s flight. Any difference between the stated ARV and actual value will not be awarded. Grand Prize Winner and Guest are solely responsible for all baggage fees, food and beverage, gratuities, other incidental hotel expenses and other expenses not listed in these Official Rules. Grand Prize Winner and Guest must travel from one departure location and must travel on the same itinerary. Travel must take place on Friday, Sept 7, 2018 and Sunday, Sept 9, 2018. If Grand Prize Winner resides within a 100-mile radius of San Francisco, ground transportation may be provided in lieu of air transportation and no compensation or substitution will be provided for any difference in prize value.